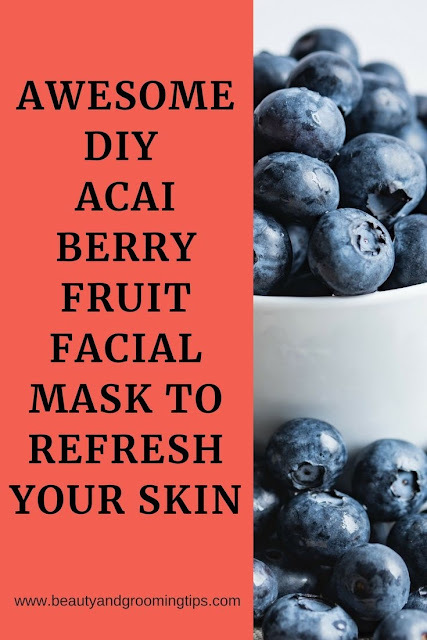 Let me tell you about a remarkable acai berry fruit facial mask that I often use to pamper my skin and this has the same effect on your skin as one of those 100 dollar clay facial masks that you get at your day spa. The amazing little acai berry that comes out of the rain forests of Brazil has antioxidants. And antioxidants are known to prevent free radicals that produce harmful oxidation and oxidants that tend to speed up the aging process. Now let’s talk about Green French clay. This clay has enormous cosmetic and health benefits. Read all about the beauty uses of green clay here. A combination of these two ingredients makes an amazing mask that works like charm on skin that feels like burlap due to the harmful effects of pollution, stress, lack of sleep, poor diet, exposure to sun, tobacco smoke etc. Mix in a few tsps of French Green clay with the acai berry powder, and some mineral water, acai juice, or even the acai gel. Add some drops of any essential oil/lemon juice. Your consistency should be thick and moist. Liberally apply the mask to your face and neck, leaving the eyes clear. Wash off after 15 minutes. You will feel refreshed and like you just had a one hundred dollar facial. The super ingredients found in this facial mask deep-cleanse, detoxify, exfoliate, tone, hydrate, stimulate collagen, regenrate skin cells, prevent wrinkles, nourish, protect, and balance. For those worried about the visible signs of aging, RioLife Certified Organic Freeze Dried Acai berries boost skin with a bounty of essential nutrients, antioxidants and vitamins including; omegas 3, 6 and 9, vitamin E, iron, calcium and magnesium. The combination of these extremely beneficial properties provides all the support and protection that is needed for skin to be healthy, thus looking and feeling great. This sounds like it would really work, can't wait to try it. Thank you.